The most important part of studying actually occurs before you even start to relearn (or learn) the material. Today, we break down how to create a study plan that is mindful, achievable, and flexible. We will also explore the reasons why a study plan might fail and what to do. This may seem aspirational for some of you. Your students may inform you of about a test the night before; maybe you don’t know until after your child has taken it. Conversely, your child’s teacher may not be giving you notice. That student isn’t quite ready for creating a study plan yet. That student should still be working with their family and team on learning how to take control of their time and their calendar. Once the student is successful in these areas, there will be no more academic blindsides. For help and advice on how to get your student ready for this episode refer to Episode 02 of the podcast or our blog from May 15, 2018, where we talk about using a calendar and managing time. There are several steps for a student to take before they actually embark on studying. In this blog, we will outline the five steps for creating an appropriate study plan. Just so you are aware, most students skip steps one through four. This is why it is really important to understand that it is not about the time spent on studying, it is about the way in which the studying is being done. Quality over quantity. Your calendar should always be booked with any and all commitments. This means afterschool sports, religious programs, clubs, tutoring, etc. This makes it easier to create an appropriate and achievable study plan. This is a very important step for most students since they tend to spend time studying what they already know. To help with this step, we like to use what we call the “red right/green light” technique. For this strategy, you use different colored highlighters to categorize information. You use a green highlighter to highlight the material you already know and feel confident about. You do not need to spend a ton of time on anything you already know (highlighted in green). A yellow highlighter can be used for information that is somewhat understood, but is not yet a strength. Then, a red or pink highlighter is used for the material that you do not know and really need to spend time with so that they can be turned into greens. The information that is highlighted in red can be broken down into what the student does not quite understand versus what they just do not know at all. Before step two is complete, students should go through their study guide and write and label how many greens, how many yellows, and how many reds they have. Therefore, when they are done with this step, they are able to tally up how many of each color they have. Chunking means breaking the big whole into tiny, small, easy parts, making it much more manageable and doable. Which will, in turn, make the work a lot less aggravating. Dividing the greens, yellows, and reds from step 2 by how many actual days you have to study is crucial. To be clear, at this point, the student has not yet begun actually studying any material. These are the actions that must take place before that starts. In this step, you must ALWAYS start with the day of the test and work your way backwards. For example, let’s say there is a test that is ten days out. For day nine, which is the day before the test, you calendar nothing. This is a Buffer/Review day. No new information should be learned on this day. This means that all the material by this day should be greens. Now, we have eight actual days to study and review. For the sake of making things simple, let’s say that after completing steps two and three, you have discovered that you have eight greens, eight yellows, and eight reds. So for day one of studying you would plan to review one green, one yellow, and one red. This all gets put into your calendar as an all-day event. Studying for the day is complete once all yellows and reds have been turned into greens. Everyday, for all eight days, would be planned out in the same way. Thus, on the seventh day you would be studying the seventh green, the seventh yellow, and the seventh red. One other thing you must always add into your calendar as you are calendaring your plan for studying is reviewing the previous days’ information. When you sit down to start studying for the day, you start with the review. That means if you are on day three of studying you are first reviewing the material from day one and two. All of this goes into your calendar. It’s about revisiting information over time, quickly, and efficiently. Be sure to refer back to episode 03 of our podcast or our blog post from May 22, 2018, to learn about how important active studying is in this step. We are going to go through all these steps using a very common test for students in elementary school. However, keep in mind that this is just a framework and can be applied to older students. Students are usually, at some point, tested on the fifty states, their capitals, and their locations. For this example, we are going to assume that the student is getting tested on all fifty states and capitals at once, and that spelling counts. The teacher gives notice about the test twelve days before the test. This covers step one of finding out the date of the test. Now, addressing step two, figuring out what the student already knows versus what they need to know. For a states and capitals test the student has four major components to know that you have to multiply by fifty. The four major components are the state, the capital, the location, and the spelling. That is a total of two hundred components that the student is responsible to know in twelve days. The way to take stock on what the student knows is to give a practice test with a map. Let’s say the student remembers twenty-five states, twenty-five capitals, twenty-five locations, and twenty-five words are spelled correctly. Now we have a baseline and we can make a plan. Now we move on to step three; how many days do they have to review for the test? In this example there are twelve days until the test, meaning that the eleventh day is the Buffer Day, so there are a total of ten days for the student to learn all fifty states. This would break down into five states a day, plus the components that come with each state. Day one, the student reviews states one through five. Day two would begin with a review of states from day one (states one through five from the previous day) and the new information of states six through ten. On day three the students review the states one through ten and then add states eleven through fifteen. This is all planned out visually, on their calendar, so that the student knows how to manage their time as well as knowing what they are responsible for each day. However, this formula that we teach might not work every single time and for every single student. There are six reasons why the plan you make might fail. The student fails to create a study plan as soon as they find out about the test. As education therapists, we can try to teach and encourage our students to be efficient with creating their study plans, but in the end, it is up to the student to be aware and to implement it. Educational therapy is about teaching students to hold themselves up, not holding them up. The student sets out to accomplish too much every day. This is why a calendar is so critical. If you know you have a day that is busy after school because of sports or other events, you need to plan less for that day or plan no review time for that day depending on what the schedule is. Other commitments may prevent a certain day or two from being a part of the study plan altogether. The student did not have a complete grasp of the knowledge that they were being tested on. A test should be a review of information learned in the classroom, of concepts, and of the homework assigned. When the student is lost in this part of learning and in the introduction of new information, it’s not reasonable to assume that a study plan is going to be effective because they have not learned the information. You can not do a Red Light/Green LIght if everything is red. The student has waited until the last minute. Cramming is not effective. Repetition, practice, and exposure over the course of several days and multiple locations with different stimuli around is really critical to how we learn. If students are waiting until the last minute, they are not giving themselves a chance. The student is being rigid about their plan and not allowing any room for flexibility. The Buffer Day is there in case you are not able to stick with the study plan. Although we call it a Review Day, sometimes life gets in the way and that day needs to be used for studying. There is just not enough time. In this scenario, there is no plan for a buffer day at all because there is not enough time. The Buffer Day is turned into a complete Review Day. This situation creates an opportunity for parents to partner with their child’s teacher. Often times teachers will be willing to give the parent a heads up when they are planning for tests. 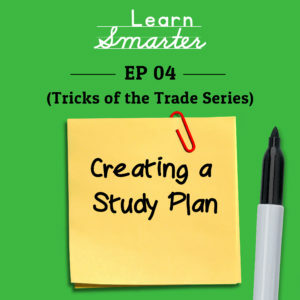 Rachel & Steph examine a common studying mistake–student’s failure to make a study plan! In this episode, they break down why it’s important to have a plan and explain the 5 steps required to create a plan that’s mindful, achievable and flexible. They also talk about the 6 common study plan pitfalls and what to do when a plan isn’t working. In this episode, Rachel & Steph mention Episode 2 “How to Calendar” and Episode 3 “The Do’s and Don’ts of Studying”–be sure to scroll back and check it out! Don’t forget to go to our website, www.learmsmarterpodcast.com, to join our community and to receive the freebie Calendar Checklist from episode 2 “How to Calendar”.